Averaged 3.6 points (seventh on the team), 0.9 rebounds (10th) and 0.8 assists (seventh) while ranking third on the team with 28 3-point field goals made…finished the season shooting .833 from the free throw line as he made 10 of his 12 shots from the line during the season including the final seven of the season…his play with his ability to hit important 3-point shots helped lift Florida State into the NCAA Tournament for the first time since 1998 and into the ACC Tournament championship game for the first time in school history…his 28 3-point field goals made rank as the fifth highest single-season total by a freshman in school history…the fourth most prolific 3-point shooter among freshman in the ACC with his 28 shots made from the bonusphere…he trailed only Seminole teammate Chris Singleton (34), Virginia’s Sammy Zeglinski (33) and Georgia Tech’s Iman Shumpert (32) in the ACC freshman statistics…played in 31 of the Seminole’ 35 games and averaged 13.3 minutes played per game…he played in double figures in 22 of his 31 appearances including a career-high 24 minutes in the Seminoles’ victory over Coastal Carolina (Nov. 22)…more than 75 percent of his shots made during his freshman season (28 of 37) and nearly 80 percent of his shots attempted (98 of 123) during his freshman where from beyond the 3-point arc…finished his first season as a Seminole with 18 steals (0.6 spg) to rank as one of nine Florida State players who earned double figures in steals during the 2008-09 season…played extremely well in the ACC Tournament as he averaged 4.7 points scored in the three games as the Seminoles advanced to the ACC Tournament championship game for the first time in school history…averaged 2.8 points and 1.3 rebounds in helping Florida State to the championship of the Global Sports Classic…he scored two points and had two steals in the Seminoles’ victory over Coastal Carolina in Tallahassee (Nov. 22), scored three points in the Seminoles’ win over Western Illinois also in Tallahassee (Nov. 24) and added three points each against both Cincinnati (Nov. 28) and California (Nov.29) in games played at the Thomas & Mack Center in Las Vegas…he averaged 13.5 minutes played per game and totaled two assists and two steals as Florida State finished with a 4-0 record to claim the tournament championship…the Seminoles’ victories over Cincinnati (NIT) and Cal (NCAA) came against two teams that played in post season tournaments…scored six points on a pair of 3-point field goals to help Florida State over La Salle in the second game of the season (Nov. 18)…both of his 3-point shots made gave the Seminoles the lead the decisive second half against the Explorers…his first came at the 17:37 mark and put the Seminoles up 28-26…the lead was Florida State’s first of the second half and first since the 11:55 mark of the first half…his second shot from the bonusphere put Florida State ahead 55-52 with 4:10 remaining the game…that second made 3-point field goal was very important because though La Salle took the lead it was never by more than one point in the final four minutes of the game…the Seminoles took the win on the road, 65-61, in Philadelphia…back to back 3-point shots and eight total points in the first half helped the Seminoles recover from as much as a 12-point first half deficit to defeat Western Kentucky in the Orange Bowl Classic at the Bank Atlantic Center in Sunrise, Fla. (Dec. 28)…all eight of his points came in the final six minutes of the first half as the Seminoles rallied from a 16-4 deficit to take a 37-34 lead at the intermission…two free throws at the 5:51 mark brought Florida State to within five at 26-21…he then scored six consecutive points on consecutive 3-point shots at the 3:31 and 2:45 mark (within 46 seconds of each other) to give Florida State a 35-29 lead with 2:45 left before halftime…his first 3-point shot gave the Seminoles a 3-point lead and allowed them to take the lead into the locker room at halftime…the Seminoles won the inter sectional game against the Hilltoppers 82-69…scored six points against Texas A&M Corpus Christi (Jan. 3) in Tallahassee as Florida State led wire-to-wire in gaining the 69-48 win over the Islanders…averaged 3.1 points and 1.1 assists in 13 games against teams that played in the NCAA Tournament and averaged 2.9 points and 0.6 rebounds in seven games against teams that played in the NIT…(vs. Boston College): scored zero points and zero assists in the Seminoles only game of the season against NCAA Tournament participant Boston College…earned four minutes of playing time and missed his only field goal attempt as the Seminoles fell on the road, 72-67, to the Eagles in Chestnut Hill (Feb. 24)…(vs. Clemson): averaged 5.0 points and 2.0 assists in two games against NCAA Tournament participant Clemson…shot 40 percent from the field (four of 10), made two 3-point field goals, earned four assists (against only one turnover) and had two steals as the Seminoles swept the regular season series from the Tigers with wins on the road in Clemson and at home in Tallahassee…averaged 5.0 points and 2.0 assists in two games against NCAA Tournament participant Clemson…scored three points and added one assist and two steals as Florida State earned one of the most incredible come from behind victories of the year in all of college basketball in defeating the Tigers, 65-61, on the road (Feb. 7)…the Tigers led by as many as 19 in the second half before the Seminoles came crashing back to silence the sold out crowd at Littlejohn Coliseum…his only made field goal of the game came in the first half with 6:58 left before intermission…it was important because it closed the Seminoles’ deficit to 10 and helped Florida State trail by only eight (30-22) at halftime after having fallen behind by as many as 13 in the first half…a steal and an assist led directly to four points in the second half as Florida State climbed the ladder from its second half deficit for the victory…scored seven points and handed out three assists in the Seminoles’ 73-66 victory over No. 12/13 Clemson in Tallahassee (Feb. 28)…all seven points came in the first half and helped Florida State take an insurmountable 39-27 halftime lead…scored what proved to be the game-winning basket on a 3-pointer at the 10:19 mark of the first half to give the Seminoles a 14-13 lead – one they did not relinquish…helped directly account for 13 first half Seminole points with seven points on his own and three assists… (vs. Duke): averaged 1.7 points and 1.7 assists in three games against ACC Tournament champion and NCAA Tournament participant Duke…was tied for second on the team against the Blue Devils with five assists and had two steals in the three-game series…earned three assists and pulled down two rebounds as the Seminoles’ played host to Duke in Florida State’s ACC season opener…the Blue Devils held off the Seminoles in winning 66-58 in a game played in Tallahassee (Jan. 10)…led the Seminoles and tied for game-high honors with three assists…all three assists came in the second half as Florida State worked itself out of a hole to get back into the game…all three assists came in the final nine minutes of the game and led directly to six points as Florida State cut its deficit to single digits…scored two points in eight minutes played as the Seminoles traveled to play at Cameron Indoor Stadium in Durham for the first time in his career…the Seminoles fought valiantly but fell in the final seconds 84-81 in Durham (March 3)…a jumper with 6:06 left in the first half gave Florida State its largest lead of the game, 28-20…the Seminoles led 40-34 at the intermission…totaled three points and two assists in 18 minutes of playing time as the Seminoles battled Duke in the championship game of the ACC Tournament (March 15)…the Blue Devils led the entire way for a 79-69 victory…his made shot from the bonusphere helped the Seminoles pull to within 42-31 with 15:51 remaining in the game…the Seminoles led by three early and got to within six in the second half before falling in their first ever ACC Championship game…(vs. Georgia Tech): averaged 4.0 points and 2.0 assists in two games against Georgia Tech…the Seminoles defeated the Yellow Jackets during the regular season and again in the quarterfinals of the ACC Tournament…the Seminoles’ victory in the ACC Tournament was their first of the tournament and began them on the road to playing in their first ACC Tournament championship game in school history…totaled two points and one assist in the Seminoles’ 64-62 victory over Georgia Tech in the ACC Tournament at the Georgia Dome (March 13)…a dunk at the 5:13 mark of the first half gave Florida State a 23-17 advantage….his basket helped the Seminoles take a 33-27 lead at halftime…also credited with an assist in a basket by fellow Seminole freshman Xavier Gibson at the 7:02 mark of the first half to give Florida State a 17-15 advantage…both the assist and the basket in the first half proved pivotal as the Seminoles had to rally from behind in the last minute of the game to gain the 64-62 win…Florida State secured the victory on an old fashioned three-point play by Derwin Kitchen with 7.7 seconds left in the game…scored six points on two made 3-point field goals in Florida State’s 62-58 victory over Georgia Tech in Tallahassee (Feb. 5)…six important points in the first half so as not to allow Georgia Tech to take any more than a seven point lead and take control of the game…both 3-point shots were quick hitters and came within 1:12 of each other…the first at the 3:43 mark drew Florida State to within 24-20 and closed a seven point Yellow Jacket lead to only four…the return trip 3-point shot at the 2:31 mark cut the Seminoles’ deficit to three at 26-23…though the Yellow Jackets took their lead out to 31-25 at halftime the momentum had shifted toward the Seminoles…Florida State took the lead with just over five minutes remaining in the game on a basket by Toney Douglas and went on to win their 17th game of the season…(vs. Maryland): totaled two points and one assist in the Seminoles’ only game of the 2008-09 season against NCAA Tournament participant Maryland…Florida State defeated the Terps in overtime, 76-73, in Tallahassee (Jan. 17)…his lone basket proved to be a big one as he made a jumper at the 12:33 mark of the second half to put Florida State up 50-41…basket was important because the Terps sent the game into overtime on a basket by Landon Milbourne to tie the game at 66…the Seminoles outscored the Terps, 10-7, in the overtime period to claim the hard fought victory…(vs. Miami): averaged 5.5 points, 1.0 assists and 1.0 steals in two games against NIT participant Miami…all three of his made field goals against the Hurricanes were 3-point shots and he was perfect from the free throw line (two of two) as the teams split their two games with each team winning at home…scored six points to go along with one rebound, one assist and one blocked shot as the Seminoles traveled to play at Miami…the Hurricanes pulled away late in the final five minutes for the 75-69 win at the BankUnited Center in Coral Gables…scored one shot from the bonushpere in each half…his 3-point shot in the first half gave Florida State a 36-18 lead at the 4:49 mark before the half…the Hurricanes, though, rallied for a 30-29 lead at the break…his second half 3-point shot gave Florida State a one-point lead, 49-48, with 11:35 left in the game…the Hurricanes outscored the Seminoles 18-12 over the final five minutes to take the win…scored five points and was credited with one assist and two steals in leading the Seminoles past the Hurricanes, 80-67, in Tallahassee (Feb. 18)…all five points came in the first half and all were important as they helped Florida State come within one, 31-30, at halftime…all five points came within a span of 1:04 with two of two free throws and a 3-point shot to give the Seminoles back the lead at 23-20…a steal that led to a basket by Toney Douglas at the 4:45 mark put the Seminoles up 26-22 and an assist on a basket by Ryan Reid gave Florida State a 28-22 lead with 4:16 left…he either scored or helped account for nine points in a span of only 2:41…a second half steal led to a run out lay-up by Derwin Kitchen and a 50-42 lead with 13:25 left in the game…the Seminoles scored the first basket of the second half and led for the remainder of the game…was one of the Seminoles main defenders against Miami’s All-ACC First Team selection Jack McClinton in an effort that held the star to only 13 points….(vs. North Carolina): averaged 6.0 points and 1.0 assists in two games against NCAA National Champion North Carolina…scored all 12 of his points during the two game series against North Carolina on four 3-point shots as he shot .400 percent (four of 10) from the bonusphere against the Tar Heels…tied his career-high with nine points in the Seminoles’ 73-70 victory over No. 1 ranked North Carolina in the semifinals of the ACC Tournament…the victory propelled the Seminoles into the ACC Tournament championship game for the first time in school history…the victory was also the Seminoles’ third in school history over the nation’s No. 1 ranked team…scored six of his nine points in the second half as the Seminoles led for much of the final 20 minutes in taking their first ever ACC Tournament victory over the Tar Heels…put the Seminoles up by five at 51-46 with a 3-pointer at the 12:25 mark and a second came at the 10:57 mark to once again increase the Seminoles’ lead to five points…his 3-point baskets came within 1:28 of each other and allowed Florida State to keep the second half momentum on their side…added an assist on a third three pointer in the half (this one by Derwin Kitchen) to break a tie and help the Seminoles regain a 58-55 lead with 9:33 remaining in the win…beginning with his 3-pointer at the 12:25 mark, the Seminoles outscored the Tar Heels 25-24 to gain what will long be considered one of the biggest wins in school history…scored three first half points on a 3-point shot as Florida State was shocked by North Carolina, 80-77, on a buzzer beating 3-pointer by All-American guard Ty Lawson in Tallahassee (Jan. 28)…also added one steal in nine minutes of play as the Tar Heels rallied back from as much as a nine point deficit in the first half to gain the win…(vs. NC State): scored nine points, pulled down four rebounds and earned two steals in the Seminoles’ only game against NC State during the 2008-09 season…was the Seminoles’ fourth leading scorer in Florida State’s 78-65 victory on the road in Raleigh (Jan. 13)…all nine of his points came in the second half as the see-saw game tilted the Seminoles way for the victory…the second half of the game saw seven ties and 14 lead changes before Florida State took control of the game with under four minutes remaining…was nearly unstoppable in the final 3:24 of the games with six points and three rebounds to help the Seminoles retain the lead and win the game…with the Seminoles up by two and the clock running quickly, he grabbed an offensive rebound and scored immediately on a lay-up to put the Seminoles up 67-63 with 3:22 left in the game…he then grabbed a defensive rebound and scored on the other end of the court to give Florida State a 69-63 lead with 2:03 remaining…a third rebound (and second in a 20 second span) and two ensuing free throws put Florida State up eight at 71-63 with 1:45 remaining in the win…from there the Seminoles increased their lead to 13 in running the clock out and gaining their first ACC road win of the season…(vs. Virginia): averaged 7.5 points and shot .556 from the 3-point line in two games against Virginia as the Seminoles swept the regular season series with wins in both Charlottesville and Tallahassee…he shot .500 percent from the field (five of 10) and .556 from the 3-point line (five of nine) during the two victories…all five of his made baskets against the Cavaliers were from the bonusphere…scored six points, pulled down one rebound and added one assist as Florida State won 73-62 at Charlottesville (Jan. 24)…both of his baskets came from long range…once again scored in bunches with his first long range shot giving the Seminoles a 13-5 lead at the 13:04 mark and his second putting Florida State up 18-5 at the 11:27 mark…his two baskets came in a span of 1:37 and helped Florida State take a commanding 30-16 lead at the intermission…Florida State cruised to the ACC win on the road to gain its third conference win of the season…tied his ACC and career scoring high with nine points – all on 3-point shots – in the Seminoles 68-57 victory over Virginia in Tallahassee (Feb. 10)…three first half points gave Florida State a 13-12 lead at the 10:18 mark before halftime…started a Seminole run with another 3-pointer to give Florida State a 43-41 lead with 7:41 left in the victory…his basket began a three minute stretch that saw Florida State outscore Virginia, 9-2, to take control of the game…closed the scoring steak with a 3-pointer at the 4:26 mark to put the Seminoles up 52-43…(vs. Virginia Tech): averaged 0.0 points and 0.5 assists in two games against NIT participant Virginia Tech…played in both games as Florida State defeated the Hokies in Blacksburg and in Tallahassee to sweep the regular season series…earned five minutes of playing time as the Seminoles won 67-65 in Blacksburg (Feb. 21)…the Seminoles won the game on a buzzer-beating jumper in the lane to gain the win on the road…the win upped the Seminoles record to 21-6 overall and 8-4 in ACC play…earned one assist in six minutes of playing time as the Seminoles defeated the Hokies, 63-53, in Tallahassee (March 8)…helped Toney Douglas, Uche Echefu and Brian Hoff celebrate Senior day in Tallahassee with the win…the victory brought the curtains down on one of the most successful regular seasons in the history of the Seminole basketball program…the Seminoles finished the regular season with a 23-8 overall record and a 10-6 mark in ACC play…the Seminoles finished in fourth place in the ACC standings with their 10-6 record…(vs. Wake Forest): scored zero points in 16 minutes of play in the Seminoles only game against NCAA Tournament participant Wake Forest…the Seminoles fell to the Deacons, 86-63, in a game played in Winston-Salem, N.C. (Feb. 14)…(in three games during the ACC Tournament):averaged 4.7 points, 1.7 assists and 13.0 minutes played in three games during the ACC Tournament played in the Georgia Dome in Atlanta (March 13-15)…helped the Seminoles to victories over the Georgia Tech in the quarterfinals (64-62, March 13) and No. 1 ranked North Carolina (73-70, March 14)…the victories over the Yellow Jackets and the Tar Heels advanced the Seminoles to their first appearance in the ACC Tournament championship game in school history…scored two points and added one assist against Georgia Tech, totaled a career-high tying nine points and two assists against North Carolina in the semifinals and had three points and two assists against Duke in the championship game…shot .444 from the 3-point line (four of nine) and had five assists against only two turnovers in 39 minutes of play in the three games…the Seminoles’ victory over No. 1 ranked North Carolina was only the third over the nation’s top ranked team in school history and was the final loss of the season for North Carolina which won their next six games and the National Championship…(vs. Wisconsin in the NCAA Tournament): scored zero points, pulled down two rebounds and blocked one shot against Wisconsin in the first round of the NCAA Tournament…the Badgers rallied from as much as a 12-point deficit to recover from a deficit, take the game into overtime and defeat the Seminoles, 61-59, in a game played at the Taco Bell Arena in Boise, Idaho…the Seminoles’ appearance in the NCAA Tournament was their first since 1998…(vs. Florida): scored three points and pulled down one rebound in six minutes of playing time as Florida State played their only game of the season against NIT participant and in-state rival Florida…Florida State won the game, 57-55, in Tallahassee (Dec. 7) to mark their third consecutive victory in the series over the Gators…his first career 3-point basket against a ranked team came in the first half and gave Florida State a 15-8 lead with 7:52 remaining before halftime…the basket loomed large in the outcome of the game as it allowed the Seminoles to take a 26-25 halftime lead and gain the win in the second half. 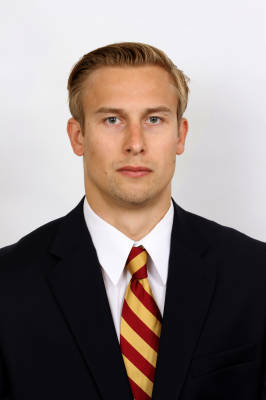 Born March 21, 1988…Deividas is the son of Virginijus Dulkys and Rasa Dulkiene… left his home country of Lithuania in 2005 to attend high school in the United States in hopes of earning a scholarship to play basketball at a Division I institution…lived with his host family – John and Shea Haycock — in Nevada while becoming a prep star in the U.S…enjoys traveling and listening to music…selected Florida State over California, Oregon State and Connecticut.